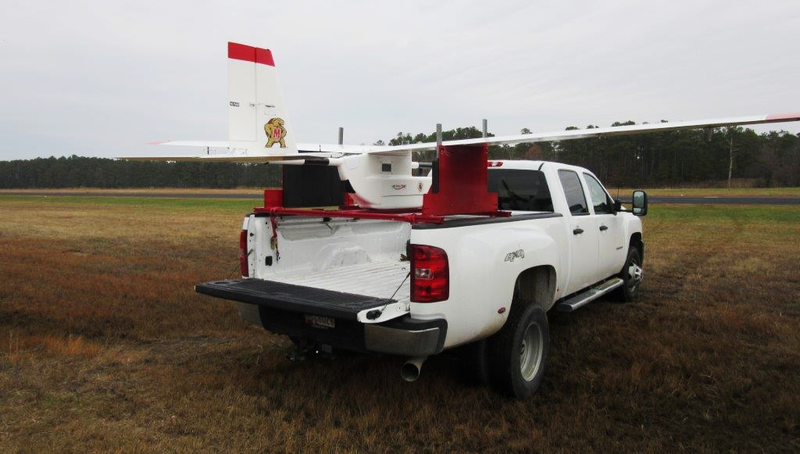 The University of Maryland (UMD) Unmanned Aircraft Systems (UAS) Test Site conducted flight operations with the Talon 240, a 140-pound UAS with a 20-foot wingspan, at Crisfield Airport in Somerset County, Md., on December 5, successfully proving the operational processes and procedures required to fly larger UAS. The airworthiness process the UMD UAS Test Site uses is one Mr. Pucciarella, a recognized expert in unmanned systems, developed based on more than 25 years working in and with the Navy. The process involves having each component of the system verified by a Subject Matter Expert with final airworthiness certified by the UMD Research Department. The UMD UAS Test Site partners with industry, academia, and government agencies to offer demonstrated expertise to support UAS-related research, testing, and education through safe, efficient, effective operations. Other Test Site supported research flights in progress include natural resource surveys, high school and university student UAS research, utilities inspections, agricultural research, and support to emergency services. The UMD UAS Test Site is a leader in unmanned systems research, development, testing, and education. The Test Site leverages the capabilities of the people and infrastructure of Southern Maryland and the University System of Maryland for technical and policy issues associated with UAS. For additional information on the test site’s mission, vision, and goals, please visit www.uas-test.umd.edu. To request research assistance, complete and return a Research Flight Request, available on the Contact Us page of our website.